Welcome, from the Executive Dessert Lounge just off the coast of Reunion Island. This is where once healthy puds go for rehabilitation after being transformed into high calorie show and indeed door stoppers, having disobeyed head chef’s orders. Today’s Fried Melon in Leather Sauce for instance can quadruple artery diameter in less than a minute, while the now compulsory Suet Chocolate Delice comes with a Ragout Jus which acts as an antidote to even the most hardy of onboard Air Conditioning viruses with only a whiff of single nostril inhalation. I awoke from this nearly ghastly dream wishing I hadn’t had the jhalfrezi midnight snack, so I left D to her own devices, no doubt devouring another Stephen King Trilogy before teatime. Week 4 commenced with a rather orange man called Alvi handing me his card and inviting us to a “sumptuous wine tasting” of his range of South African produce, including Bubbly Girl 2015 (100% true). No thenks, mitey. Only $300 a pop, too. There was gleeful rubbing of hands today because of the extra required rubbing of hands with nitric acid everywhere on QM2 due to an expected outbreak of Mad Cows Disease. So, as these Nautical Blogs are on their last sea legs with only a fortnight (Oh God) remaining before disembarkation at Australia…..
By Special Request, I’ve been asked to describe Our Living Accommodation, or Room. Well, the ‘Staterooms’ on board QM2 would be valued at £6 million leasehold in the Vauxhall area of London, large enough to house 26 families of lemurs, with minibar and daily biscuit facilities (not forgetting the pillow chocolates) and ours has a balcony which Cunard have helpfully supplied with easy access to jumping overboard at times of regular daily stress, removing the electrified handrail. Please note that balconies are not provided on decks 1 to 4 for safety purposes. The Smart Samsung TV has a Bridge Webcam channel which regularly updates the viewer on the choppiness of the ocean as “no swell, a little bit of swell, and, Really Rather Swell”. If desired, the audio switches to a live feed of The 180 Phillippino Oarsfolk down below singing “Volga Boat Men” in unison for interactive purposes. We regularly enjoy the Entertainment Director channel, where superstar Jo delights us with reruns of her favourite breakfast interviews with ship’s celebrity guests including the expert on The Battle of the Somme, and the Man Who Manufactures Cellos. The bathroom is amply sized, with shower curtain in chiffon, immovable or Captain Corduroy, and a toilet flush facility more powerful and marginally louder than the Jubilee Line safety door system. Finally, the Comedy Hanger System (CHS) comes in three varieties: awkward, irritating and unpopular, with regular need to resort to the Hilariously Priced Valet Service (HPVS) who will re-iron your smalls at a moment’s notice. Jerry, our room janitor, promises me some wire replacements after he watches Mommie Dearest tonight. The Final Flourishes pre Perth soon. “Sum peepul hef cot beega feesh ta frar”, were the words spoken by our new South African rather sweet dinner buddies. “Ennee Kice, ha deed thet gar git a job on theece shipp?” Hubby was of course talking about Louis Hoover, the least charismatic and most flat “singing” Willesden Green veteran of London’s Rat Pack musical. And he was rart. He’s certainly left a vacuum for future entertainment here. (Ker-Ching). Recap. Winding down a week before departure from this vessel is a protracted business. I’m spending pre 6pm time writing songs (it says here, on number 3 as we speak) and alternating between gym and spa depending on whether or not the cross trainer machines are swaying more than 90 degrees to the horizon. D is taking in afternoon movies and theatre shows though her Sea Shanty classes aren’t going too well. We were shockingly awoken by the P.A. announcing yesterday morning that the traditional Cunard Tug of War competition was postponed due to High Wind, though serving of the Lunchtime Chilli continues unabated with extra beans. D and I did the Roaring 20s Ball (so named as it’s the years of birth for most of the guests, apart from our Oz friend Christine (“Have another bloody cocktail, ya wimp”), and I became friends with a jolly decent Chicago Custom Car and Lithography multimillionaire called Don (who bummed a few fags off me), and we’ll hook up in Chicago Later This Trip. His missus hates this ship. A lot. Which brings us to today, One Day Before Perth. All decks closed due to Danger of Being Blown Orf. TV Screen says “Rough”. Not quite as frightening as the insincerity of Northern Magician Phil Hitchcock, who ended his act last night being swallowed up by a yellow balloon to tepid applause. If only. Consequently the Jigsaw Boards are in Full Swing, and Knitting and Crochet Afternoon classes are packed, ironically running concurrently with the Mah Jongg groups ** (** N.B. Knowledge of Mah Jongg hands required to understand this quip). Finally, before we begin stopping off at Perth, then Busselton (a bit further round) and then Adelaide (before getting orf for good at Melbourne), I’d like to scream. Final Betwixt next week, you lucky people. FINALLY. THE NEWS YOU’VE ALL BEEN WAITING FOR. THE FINAL CAPTAIN’S BLOG FOR THIS BIT. Carol Zimmerman and hubby (our jovial extremely OAP South Africans) confessed to us over dinner last night that they own a Plumbing Empire in Cape Town, whose motto is “We’re Number One with your number twos” (compared of course with my hugely original company slogan “Still turning your number twos into number ones”). Her ladyship thence later debuted in karaoke, singing some Whitney!!! I have Video Evidence. She’s actually quite remarkable (and please don’t object too much to my respelling of their accent, it’s all done quarrrt affaxionutlee). Project Long Hall (see what I did there, cos of the huge longitudinal array of cabins) is coming to an end, arriving in The City Of Neighbours, Everybody Needs Good Neighbours, this coming Saturday. D and I (now both awarded Gold Status, meaning we’ve walked the circumference of the ship 2000 times) are preparing for our final Formal Attack on the 19th Century entertainment donning our dickies and dresses (I’m wearing a long flowing silk number by Aldi & Lidl), and then it’s three more days of Gigacalorie Cell Deck H, and One More Stagger to the Only Planetarium At Sea to listen to an American Megastar discussing problems with his asteroids. So far, the Former Convicts we’ve met are greatly enthusiastic, hugely pleasant, say “Yee, Ar No” (end word rising ever upwards, greeting the newly located stars above with playful fingertips). So far indeed, loving Australia and can’t wait to ditch the jalopy. Smokers’ corner (two tables on Deck 8 and a gay waiter from Rotherham named Scott) remains a constant source of high quality gossip. F’rinstance, Gladys (really) on Deck 10 (the VERY posh Staterooms) has changed cabins SIX times (ousting others) mainly down to inconsistent water pressure and the wrong kind of tonic in her personal maxibar. Scott is in fact leaving the ship, and Cunard itself, at Sydney to meet his partner at Mardi Gras thence flying home to join British Airways, grounded this time. Nice chap, but the shorts were simply a mistake. Tonight we went to see a floating older version of One Direction meets Il Divo (unfortunately not called Knots Cruising, but “The 4Tunes”). Majestic Mediocrity. The wine was good. Ended up meeting Aussie tour reps on post midnight deck claiming they were good because “those guys were hot” (opinions of both male and female). 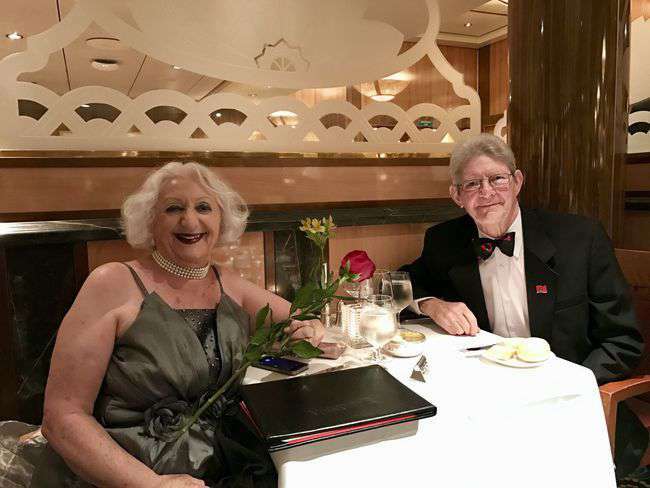 What to say in summary about a Cunard Cruise (of over 10 days in any case: ours was 39). Food? Ridiculous, astonishing but eventually tiresome. Decor and facilities? Mostly wonderful. Entertainment? Very mixed…mostly 18th Century in originality, but huge though massively old fashioned stage shows with great singers dancers and orchestra/band. Passengers? Decrepit. Crew? Mostly jolly. Internet, dire and expensive, one does turn to it to send these endless missives back to my supposed fans (those who’ve responded with an absence of words by the way, I do understand and I’ll speak to you again someday). Finally, would I recommend this method of travel for enjoyment porpoises (not a bloody bit of sealife spotted in the oceans incidentally, they’d probably seen the shows)? Not for over 10 days I’d say, unless you like the repetition, routine, refreshment, rigmarole and recuperative restorative requirements of relaxation (and other words beginning with “r”) and of course the stability and comfort of “The World’s Most Stable And Comfortable Ocean Liner”. The stopoffs though have been fabulous: we’ve met hosts of fab staff, dinner mates, deck mates and a couple of extremely weird World Cunard Club Reps, who, despite both being German, both sound German and don’t seem to do much except present flowers to stalwart passengers who keep doing the whole 105 days every year. Karaoke’s been ok. (OK, I became a legend for three nights). Sue (and Mum), Christine, Don (see ya in Chicago) Neil and missus, John and Anne, Carol and hubby from South Africa (with the flown in food, weird), Antonio, Daniel, Rangith, and Jerry our room chap, we love and thank you all. We don’t particularly thank Ruth Madoc copycat Ents Director Jo with the peculiar teeth and hand movements, and the only person I’ve ever heard pronouncing the City of Neighbours as “MEL-BURRRRRN”. Neither do we thank Charisma Bypass First Captain Kevin, though Current Captain Christopher (white slip-ons) has since been a revelation in a Jolly Hockey Sticks I say Old Chap, Button Up yer Hatches and What-Ho kind of way. As for the Navigator, a Scottish gentlemen called Mo, I genuinely haven’t understood a word he’s said. (Gordon H and Johnny MacA, I will ALWAYS forgive your beautiful tongues). Last, but not least, in the optimistic yet inevitable words of Mrs Carol Zimmerman, a lady so admirable in every way: “I’ll have the Kee Larm Par”.